This card is a good choice if you need a greeting or birthday card for a man. 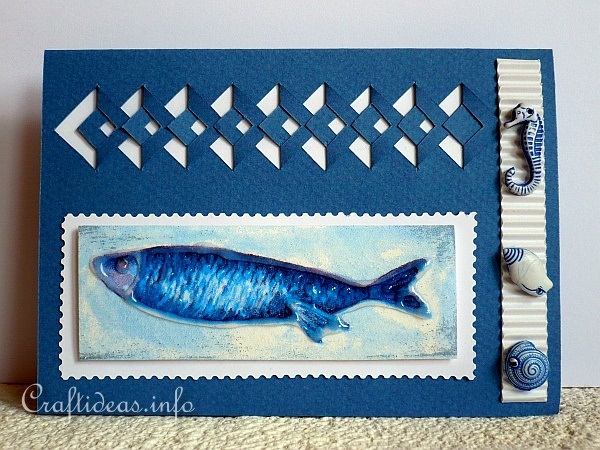 The fish motif and the colors of blue and white reminds one of summer at the lake or sea where men love to be found with their tackle boxes and fishing rods. 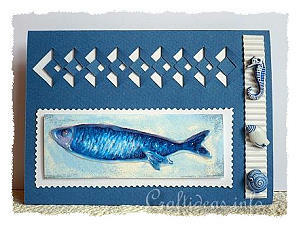 The top design created by a Lacè template looks like fish scales and accents the card perfectly. 1. Use the lacè template and cut a pattern onto the top of the card. 2. Prepare your motif according to the directions below. 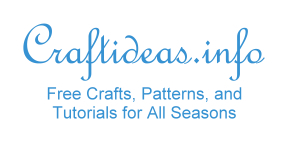 Fuse the motif onto white cardstock and use decorative edged scissors to cut a border around it out. Now glue the prepared motif onto the card. Use the picture as a placement guide. 3. Cut a strip of the white corrugated cardboard out and glue it to the right side of the card and glue the maritime buttons onto the strip. 4. Glue a piece of white paper inside the card cover to show through the lacé cut pattern.